Brian Braddock's life was planned for him from before he was even born. Merlyn sent his father James Braddock to Earth to sire a champion who could defend the multiverse. As a young man, Brian Braddock visited America in a student exchange program, rooming with Peter Parker (a.k.a. Spider-Man), alongside whom he faced the assassin Arcade and the lycanthropic menace know as Litter. 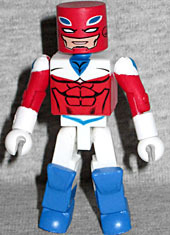 This is our second Captain Britain Minimate, and he's wearing his third costume - the one that looks very much like the second, but with big panes of color rather than a Union Jack. He's painted nicely, and this time the mask/helmet isn't a head cap. That makes the head smaller in proportion to his body, and makes him look bigger by comparison. He should really have a "powerhouse" chest to bulk him up, though: remember, this is a guy who could throw down with Superman and win. Handily. Excalibur's earliest escapades found them preventing Juggernaut from escaping prison, and taking on the Crazy Gang and Arcade in his deadly "Murderworld." Who could have imagined that years later, due to the decimation of the mutant population following "M-Day," that the unstoppable Juggernaut, would journey to England and become a trusted member of team Excalibur. 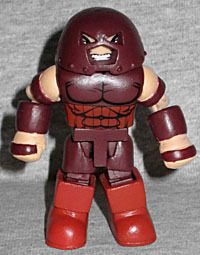 The only previous Juggernaut Minimate came out in Series 5, and while it was good for its time, this one is a lot better! A lot bigger. A lot meaner. That one had new gloves, but that was the only conceit to his mighty size. This one gets even bigger gloves, plus giant new boots, thigh pieces, a waist, upper arms and a chest cap bigger than any we've ever seen before. The helmet is new as well. Just as on the previous Juggernaut, the eyes and mouth are cutouts that allow you to see the face inside. Unlike the previous Juggernaut, however, the eyes and mouth don't really line up with the holes in the helmet. When you remove the dome, there's a shaggy mop of red hair to replace it with. Of course, he still looks furious. 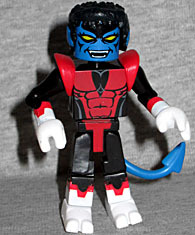 This Nightcrawler is not a significant improvement over the first one: he's using the same feet, hands and tail (since they're otherwise unique), but in lieu of the specialized chest cap, his details are painted on and he has two flared bits on his shoulders. That does mean he's skinnier, but was anybody bothered by the old style? It was black! You couldn't tell how chesty he was. The anatomy paint is more detailed now, and so is his hair. 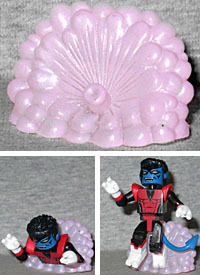 Nightcrawler comes with an accessory: a translucent pink cloud of smoke, suggesting he just bamfed into the display! It's not as impressive as the Magik/Blink stepping disc, but it's very specifically Nightcrawler's. There's a single peg, where you can either plug in one of his feet or, if you don't mind him being so near the ground, his waist. The second one looks better, but you'd need to find a way to lift the base up. Meggan and Brian Braddock (a.k.a. Captain Britain) helped found Excalibur. After defeating Mastermind, Brian was crowned King of Otherworld, with Meggan as his queen. The pair recently returned to their own world (Earth-616) during a reality storm, and Meggan appeared to sacrifice herself to seal an interdimensional rift, thus preventing the reality disruption from spreading across the multiverse. That was during the House of M crossover, by the way, but she's since gotten better. 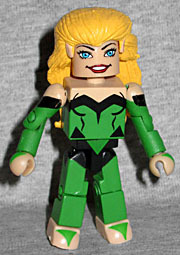 This Minimate shows Meggan in her most famous costume - not the orange turtleneck she started out in, but the green number with the black stripes around the waist and shoulders. She has new hair, with her pointy ears molded on the sides. Her hands and feet have paint to show the way her costume ran between her fingers/toes. Since she's an empathic shapeshifter, there's really no way to show her powers in toy form. Excalibur is my favorite X-Team, and Juggernaut is my favorite villain, so there was no way I wasn't getting this box set. Plus, with the addition of Shadowcat and Phoenix, you're just one Widget short of a complete team!